Keigo 敬語 literally means “respectful language” and is used in formal situations (but mostly business). 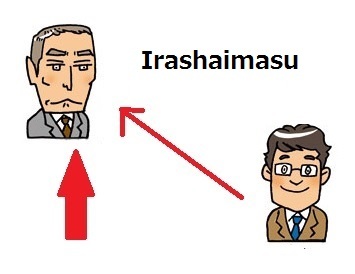 If you are studying Japanese at university you will go over this. So this entry is to help with people who will go to work in Japan (teaching English or other business) and for university students. There are several different types of keigo which are used in different ways depending on the situation and who you’re speaking to, and who you’re talking about. When I learnt keigo the teacher decided to combine all of these together into one big lesson, which is very confusing! We barely practised either which meant that when we had our keigo speaking exam I broke down and cried after! It was so bad! I don’t want anyone to ever go through that again! So I’m having lessons now specifically for keigo/business Japanese and will explain everything I learn to you. So just to help this is a good diagram of the different keigo. Believe it or not the ます form of the verbs you learn is a form of keigo which is used between equals (marked as “fair” in the diagram. This is also called teineigo). When you use this it it with a stranger and you don’t know their social standing, or someone on the same level as you (ie age, rank in a job etc). Sonkeigo is used to elevate the person you are talking to, and Kenjougo is used to push yourself down. Sonkeigo and Kenjougo are used together, you wouldn’t mix these with other forms of keigo. In order to reduce the confusions these keigo entries will be split up and won’t come one after the other but on random weeks. Each focusing on a different type of keigo. I will also try and make each of them situational with example conversations and key phrases in bold (rather than just listing the verbs like most sites do, although there will be a list for reference) to make it easier to learn. Click here for the Memrise course covering all the sonkeigo, kenjogo, and other keigo vocabulary. Sonkeigo (also known as “respectful Japanese”) is always used when you’re speaking to someone higher ranking than you (your boss, sempai, someone you don’t know, a customer, a teacher) and is when you are talking about something they did/doing/are going to do. The first is used more with customers, and the second is used in the office. So imagine saying おVになります is slightly more formal than Vられます and so would be used in situations when you’re talking about someone who is the highest of the high i.e customers, and your boss. Vられます would be used talking about people who are higher than you like co-workers. Another thing I learnt was that if you’re using the highly formal sonkeigo with someone (your boss or a customer) you don’t use the more informal sokeigo (everyday work) with it. Every other verb used in sonkeigo gets turned into the previously mentioned お Vます になります. I know I said I wouldn’t list just vocabulary but these are good to learn before you try to jump into practicing using them in sentences. Below are some situations with these words used in a phrase in the context of a situation. As mentioned they are only used when talking about the person who is higher up than you, and when you are talking to them or to someone else (about them). The sonkeigo is highlighted. Besides practising these think up some of your own sentences you might use when talking to a boss or someone you don’t know and check with people on Lang-8 to see if it’s correct or not. If you have a one-to-one Japanese teacher it really helps to practice conversations with them in keigo. お茶でもいかがでしょうか = How about some tea (or something else)? 週末はいかがでしょうか = How was your weekend? どちらでお会いになりましたか = Where were you meeting? どちらのデパートでございますか = Which department store was it? お酒召し上がりますか = Do you drink alcohol? This is used often at work or with strangers when you’re on the same level but you want to be a bit more polite. DO NOT use this with formal Sonkeigo! If you do so in this situation it would be rude and give the impression you don’t like the person you’re talking to and want to distance yourself from them. Words like いかが or nouns like お茶, however, are polite generally so it’s ok to use them with both casual and formal keigo. 週末はいかがでしたか = How was your weekend? どちらへ会われましたか = Where did you meet? どちらのデパートでしたか = Which department store was it? お酒飲まれますか = Do you drink alcohol? I’ve found that often this form is good for repeating what people have said. These Japanese do this quite a bit so it sounds natural if you do it too. Today I ate at good restaurant with my girlfriend. Ohhh? You ate with your girlfriend? Where did you go? Use when talking about people higher than you, strangers and guests/customers. Used when talking to them or to other people about them. Do not use formal sonkeigo with people who are equal to use that you know. Do not mix formal sonkeigo and casual together (it sounds strange). If you forget formal sonkeigo try and use casual sonkeigo. You are a foreigner and Japanese people will understand if you make a few mistakes (even Japanese people don’t know how to use keigo properly sometimes). So don’t be too worried about getting everything perfect. If you can find a Japanese person to practice with (like a teacher) then great. It’s also good to learn to recognise these so you can understand when staff are talking to you and asking you questions. ますform counts as a form of keigo, and (as show in the diagram at the beginning of the post) can be used in formal situations, especially in sentences where you are talking about other general topics like “my cat is sick” (although you probably wouldn’t be telling a stranger that your cat is sick). Also, J-Talk Online has a Memrise course called Complete Japanese Keigo to help you learn the above vocabulary. Tagged Business Japanese, Keigo, Respectful Japanese, Sonkeigo. Japanese Talk Online was created by Jenn to help others others not make the same mistakes she did. Jenn is also a freelance Japanese-English translator specializing in anime, manga, games, media and business. We use standard Google Analytics tracking cookies. Nothing special. Hosting supplied by CanMarket. Setup and support by Dragon Digital.